It consists of 250 hectares of vineyards, mainly native Cariñena (Carignan) varieties, such as Garnacha (Grenache) and the grape Cariñena (Carignan), also known as Mazuela. 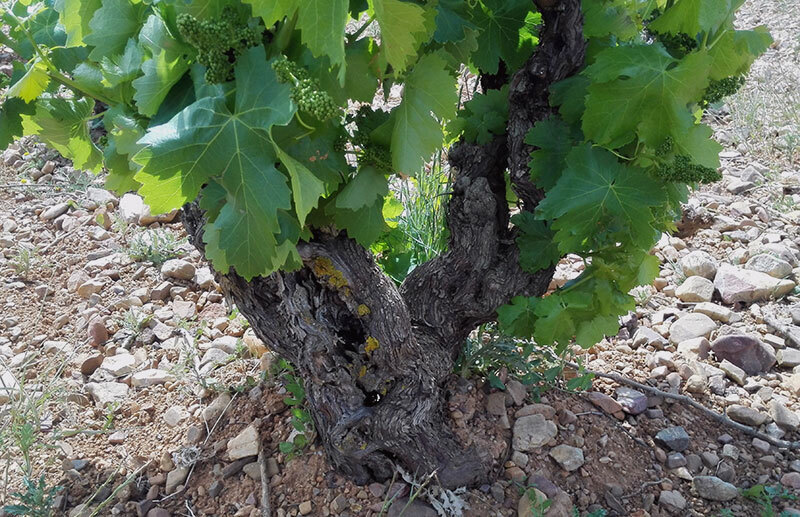 Tempranillo, Cabernet Sauvignon, Syrah and Macabeo are grape varieties, which are also cultivated in the Melendez – Molleda family estate. The estate consists of gorgeous waves of vineyards with deep soil and mild slopes which ensure there is never excess water. The crop in each plot is specified, keeping in mind the required needs of the vine and grape in each plot. Management and control of the phenological status of plants regarding climate in order to use phytosanitary products in the right proportions and achieve ever healthy grapes. Use of pheromones, an ecological system introduced for a greater and more specific sanitary control of the vine. Pheromones cause sexual confusion on moths avoiding their laying eggs on the bunches and thus avoiding a series of illnesses and quality deterioration. Since the year 2000 maturation controls are made with the grapes and they are compared with the grape harvest and ulterior analysis results.